Coming down to land at the airport on the island of Sal, Cape Verde, you can really see how dry and, well, simply, brown this island is. In many ways this may remind you of Egypt, as likewise, the barren landscape is rapidly becoming a building site. With direct flights from the UK, these ten small islands that make up the archipelago of Cape Verde are rapidly attracting sun-seekers and water sports lovers. And, again, like arriving at Sharm airport, the arrivals hall is a chaotic throng of people, where nobody seems to know which queue to join. We ended up down a little corridor that looked like it was leading to the toilets, but instead a small immigration office calmly (yes, that means slow) dealt with the visas one by one. Luckily there are only a few flights that come in each day for the moment. So a little bit of history about Cape Verde – having burst forth out of the oceans in spectacular volcanic eruptions 450km off Senegal on the West coast of Africa, the islands remained uninhabited until the 15th century when they became subjected to the unashamed use and abuse of various nationalities. It was the Portuguese that first realised their strategic importance and Cape Verde began to play its role in the international trade industry developing between Africa and the Americas. Sugar cane, salt, cotton became the main commodities on the islands, together with the rapidly growing slave trade. Attacks and piracy were rife as the Dutch, Spanish, French and the British took force across the Atlantic. However, by the beginning of the next century nearly three-quarters of the Portuguese revenue from Cape Verde was raised from the slave industry. Although, the slave trade is now a dark part of history, it was not until 1975 that the islands gained their freedom when Portugal released its hold. Today, most of Sal's industry is based around real estate and tourism and much of this is centred in the small town on the southern tip of the island – Santa Maria. There is no market to barter your way around here, but rather life appears to centre upon the jetty. Everyday you will see men cleaning and de-scaling the fish and the arrival of the fishing boats with the catch of the day provides the excitement attracting both the locals and tourists alike. When you spot them bringing in the tuna, you know what will be on offer on the menu at all of the restaurants about town that evening. Although, if you want a top tip, I recommend the Wahoo rather than the tuna and this is deliciously served up as carpaccio at many of the restaurants. This is a really delicate tasting fish that, sadly, I think, is not on the environmentally-friendly list of fish to eat. There are a couple of theories on the origins of its name, possibly a derivation of the Hawaiian Island Oahu, but also some say it's from the fishermen's cry, "Wahoo!" as they have caught the fast swimming fish. In Hawaii the fish is also known as "Ono", meaning "delicious" and with that, I couldn't agree more. Fish really is the only thing to eat here. Almost any other food, will have a carbon footprint bill to pay, as little grows on the island and other than a few scraggy dogs, I saw no other animals roaming around. Anyway, I suppose you'd also like to know a bit about the diving – we were diving with Cabo Verde Diving, who were absolutely excellent and went out of their way to help us. 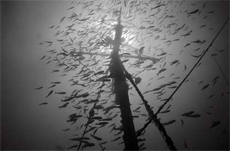 The diving is varied and often with strong currents. There are a number of reefs, drop offs, pinnacles, caverns and wrecks to explore and although the corals are not as colourful as those of the Red Sea, there is still much to see. I have no idea how many different types of moray eel I saw, together with lobster; nudibranchs; scorpion fish; triggerfish (without the infamous tyson triggerfish in sight! ); goatfish; filefish; octopi; porcupine; long-nose puffer; cornetfish and often gathered in ceilings of small caverns would be large schools of trumpetfish. The island also boasts a large number of turtles and these are often of an enormous size as they come to lay their eggs on this and other nearby islands. 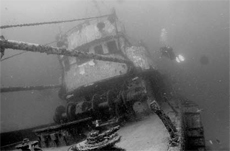 Some of the top dives included: Buracona; Choclassa; Peridão and the wrecks of Boris and S Antão. However, what really grabbed my attention were the Sand Tiger Sharks (raggies) of Cape Verde, about which little seems to be known. These somewhat fearsome-looking creatures, with a fine set of gnashers, can be found year round on the Eastern side of Sal. Unfortunately, the dive sites on this side of the island can only be dived at the rare moments when the prevailing easterly wind is not blowing (occasionally during the summer months). If you are lucky enough to dive Bera d'coral this is where these guys hang around. However, we still managed to have an amazing and unusual experience with these fair-sized beasts. Local fishermen have regularly spotted the sand tigers 'surfing' the shallow waters in one of the coves. So we headed off to wade in the rocky waters where these sharks were to be found and I have to say, that there is nothing like the shiver of excitement that you get as you watch the fin of a three meter shark break the surface so close to where we are standing. As yet, scientists do not really understand this unusual behaviour and a research group will be heading out to Cape Verde to study the sand tiger sharks this winter. Stuck out in the Atlantic, these islands are also lucky to be visited by a variety of pelagics, including a wide range of sharks that will excite the most hardy of divers. 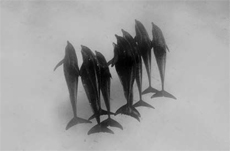 Dolphins are regularly seen performing tricks and jumps to entertain those lucky enough and from March to May, there is the chance to see orcas and humpback whales. While for July to November manta rays and whale sharks are also frequently spotted around the islands. Cape Verde offers divers another choice of location for diving without having to take a long haul flight (flight around 5 _ hours). I was still left feeling like there was more to see and I had seen some unusual sights that I have not seen elsewhere. Diving is still very new to the area and currently there are only centres based on Sal and the neighbouring island, Boa Vista. But watch out as these islands get developed and new diving opportunities arise there. 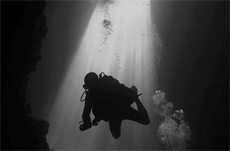 Cape Verde is gradually being added to dive tour operators listings. We travelled with Dive Worldwide. Hotel Odjo D'Agua (Eat Wahoo Carpaccio right on the ocean's edge) and Restaurante Americo's (for great grilled meat and fish). There is currently no chamber operating in Cape Verde, so patients are taken to either the Canary Islands or Portugal. But it is hoped that a chamber will be opening soon on Sal.